Are mushrooms lucky? Well perhaps they are if they’re grown in the Emerald Isle and that’s the setting for this online slot which offers rainbows, pots of gold and free spins – it’s called Lucky Mushrooms, it’s from Leander Games and you can read all about it below. 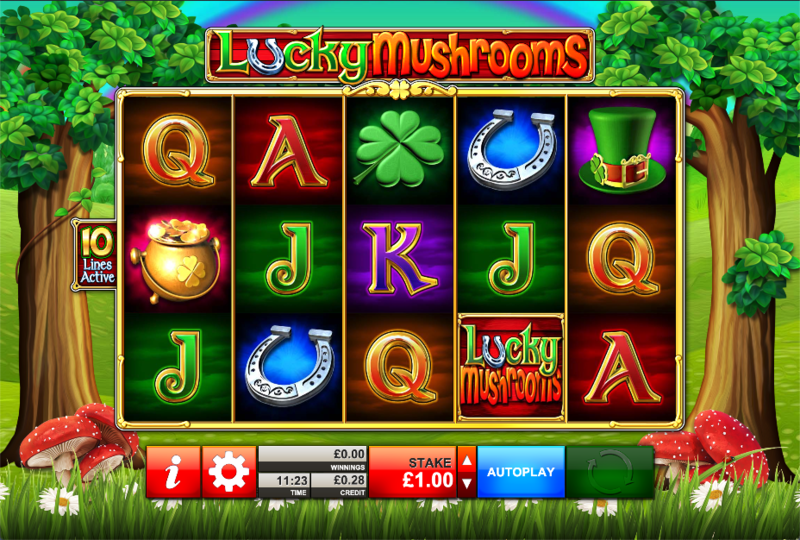 Lucky Mushrooms is a five reel slot with three rows and ten fixed paylines; those gold-rimmed reels sit against a backdrop of large mushrooms, green fields and trees under a cheerful rainbow. The high value symbols are a familiar bunch for this genre and include the games’ logo, a leprechaun’s hat, a pot brimming with gold coins, a selection of mushrooms, a four leaf clover and a silver horseshoe; J, Q, K and A make up the lower values. There’s no wild symbol in Lucky Mushrooms but there is a bonus symbol represented by the young lady leprechaun. This is triggered by landing at least three of the leprechaun scatter/bonus symbols anywhere in view for which you will receive ten free spins; during this round you should be looking out for the mushroom symbol which may appear on reel one and which will award a mystery prize proportional to your stake whenever it does. 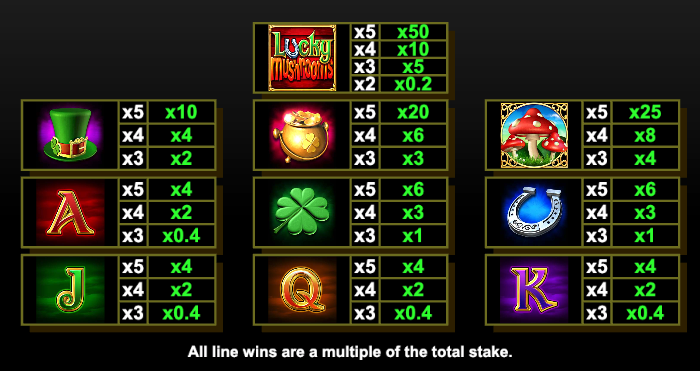 In addition a leprechaun appearing on reel five at the same time as the mushrooms on reel one will apply a mystery multiplier value to that prize amount. Lucky Mushrooms is a very good-looking slot which offers some decent wins once the free spins are triggered; it comes with some appropriate sound effects and an RTP of exactly 95.00%.